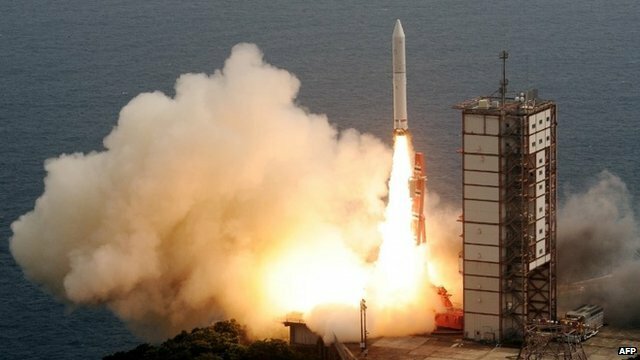 Japan has launched Epsilon, the first in a new generation of space rockets, hoping the design will make missions more affordable. The Epsilon rocket is about half the size of Japan’s previous generation of space vehicles, and uses artificial intelligence to perform safety checks. Japan’s space agency JAXA says the Epsilon cost $37 million to develop, half the cost of its predecessor. Epsilon launched from south-western Japan in the early afternoon. Crowds of Japanese gathered to watch the launch, which was also broadcast on the internet. It was carrying a telescope that is being billed by JAXA as the world’s first space telescope that will remotely observe planets including Venus, Mars and Jupiter from its Earth orbit. JAXA said the rocket successfully released the Sprint-A telescope as scheduled, about 620 miles above the Earth’s surface. Epsilon’s predecessor, the M-5, was retired in 2006 because of spiraling costs. JAXA said the Epsilon was not only cheaper to produce, but also cheaper to launch than the M-5. Because of its artificial intelligence, the new rocket needs only eight people at the launch site, compared with 150 people for earlier launches. Japan’s other recent space innovations included sending a talking robot to the International Space Station (ISS).